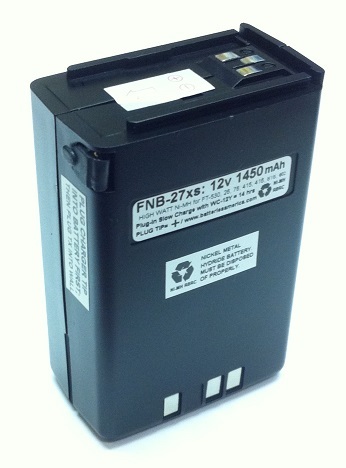 Home > Ham Radio > Battery Packs > FNB-27xs : 12volt 1450mAh Long Life High-Watt Ni-MH battery for YAESU FT-530 HT, etc. FNB-27xs : 12volt 1450mAh long-life high-watt rechargeable Ni-MH battery for Yaesu FT-530, FT-26, FT-76, FT-415, FT-416, FT-815, FT-815 etc (all worldwide versions). 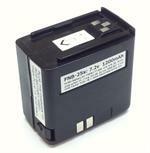 Replaces original Yaesu FNB-27. Same size as original FNB-27 (3.25"), but provides more than twice the operating time ! 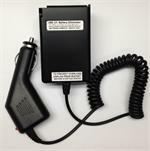 Recharges with Desktop Rapid Charger (our EMS-30Y, Yaesu NC-42) or with an overnight Plug-in Wall charger (our WC-12Y). If you plan on using a Wall Charger to re-charge this battery, we recommend the WC=12Y, because it has the necessary Amperage output (150mA/hr) for this battery. The original Yaesu wall charger for 12v packs has a rated output of 60mA/hr, which is not adaquate to charge a 1450mAh battery. 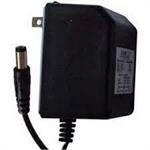 NC-18H: Wall Charger for Yaesu battery packs such as FNB-4, FNB-4A. Input: 110-120VAC. Output: 14.5VDC @ 150mA. Charges both NiCd and NiMH. Plugs into bottom of battery. FNB-25x : 7.2v 1200mAh long-life Ni-MH battery for YAESU HTs (FT-530, etc.). Out of Stock. 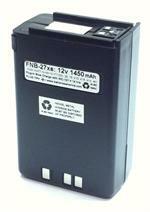 FNB-25x: 7.2 volt 1200mAh long-life rechargeable NiMH battery for Yaesu radios. Replaces FNB-25. Fits the FT-530, FT-26, FT-76, FT-415, FT-416, FT-816 etc. Recharge with Wall Charger (slow) or Desktop Charger (fast).